Looking for just the right music for walking down the aisle? 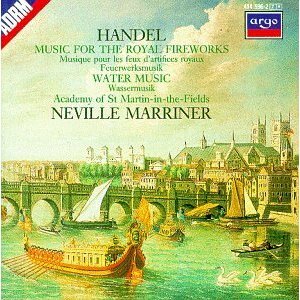 You can’t go wrong with Handel’s Music for the Royal Fireworks. And this recording by Neville Marriner and the Academy of St. Martin-in-the-Fields is one of the best. Whether you are using a DJ or playing your own CD’s – keep this one in mind. Track 1 is perfect for the processional. This recording also includes Handel’s Water Music and just about any of that suite works well for your recessional. I especially like Tracks 9 through 11. Listen to samples and enjoy!